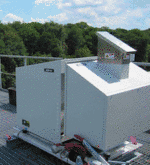 The Institute for Geophysics and Meteorology of the University of Cologne operates an array of meteorological instruments suited for measuring the thermodynamic state of the atmosphere. Our main instruments are shortly described below. IGMK also operates numerous other in-situ sensors partially on campaign basis, e.g., two HOBO weather stations, a radiosonde launching system, a standard weather observing station, and numerous humidity, temperature, and wind sensors. The AERI measures downwelling infrared radiation from 3-25 µm at less than one wavenumber resolution every ten minutes. It has potential for deriving profiles of tropospheric temperature and humidity and is also sensitive to low liquid water content clouds als well as to the CO2 column. The ceilometer CT25K is based on the light detecting and ranging (LIDAR) principle: it sends out laser pulses and measures the backscattered light (at 905 nm). From the time delay it derives cloud base height (i.e. the ceiling in aviation) as well as boundary layer structures. The cloud radar MIRA is a pulsed Doppler radar which measures vertical profiles of reflectivity, Doppler velocity, Doppler spectral width, and linear depolarization ratio at 35.5 GHz and can scan freely in elevation and azimuth. Various macro- and microphysical properties of clouds and precipitation can be derived. An infrared pyrometers (or just infrared thermometer IRT) measures downwelling sky brightness temperatures in atmospheric IR windows. One IRT is mounted on SUNHAT and measures IR brightness temperature between 9.6 and 11?m with a dynamic range of -100-200°C. Two IRTs are mounted on TOPHAT (IRT1 bandpass 10.2 – 11.9 ?m and IRT2 bandpass 11.1 – 12.8 ?m) for improved retrievals of cloud optical depth and effective radius during low-LWP clouds. 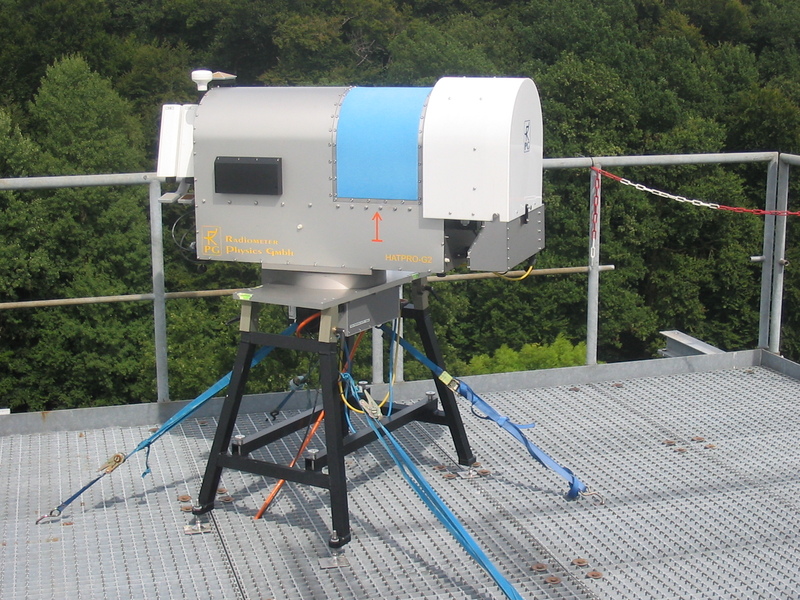 A Microwave radiometer measures spectral radiance emitted and scattered by atmospheric gases and hydrometeors. IGMK operates three Humidity And Temperature PROfilers HATPRO (TOPHAT, SUNHAT, SNOHAT) for continuous monitoring of the hemispheric distribution of cloud liquid water path and integrated water vapor, as well as tropospheric temperature profiles. Additionally, IGMK operates the Dual Polarization Radiometers DPR, which measures in mm wavelength atmospheric windows for snowfall and super-cooled liquid water retrieval. A MRR is a vertically pointing FM-CW Doppler radar operating at K-band. From the Doppler spectra the radar reflectivity factor and the terminal fall velocity distribution can be derived. 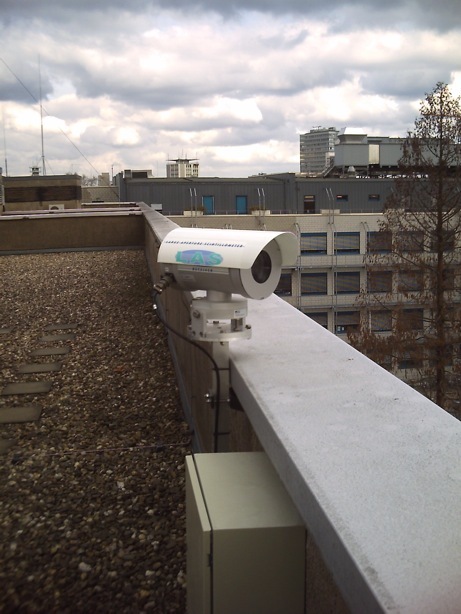 In case of rain, the Doppler spectra can be used to derive vertical profiles of microphysical rain properties, like drop size distribution and rain rate. Two pyranometers measure downwelling and upwelling solar (short-wave) radiation. Two pyrgeometers measure downwelling and upwelling terrestrial (long-wave) radiation. Can be used to calculate the surface radiation balance. A pluviometer is a universal precipitation gauge using the balance principle for solid, liquid, and mixed precipitation. Precipitation and evaporation are measured with a temporal resolution of 1 min. A scintillometer measures the path-averaged structure parameter of the refractive index of air over horizontal path. 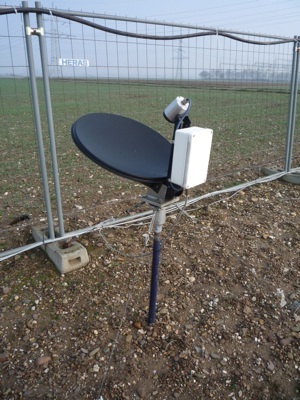 In combination with standard meteorological observations, this is used to derive the surface sensible heat flux. 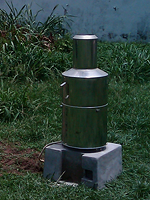 A SODAR is a wind profiler based on the SOnic Detecting And Ranging principle. A sound is emitted and backscattered at inhomogeneities of the temperature field. Travel time of the backscattered sound signal is related to distance, Doppler shift gives the wind speed along the sound beam. 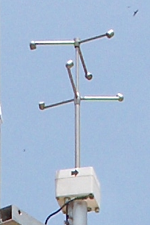 Several tilted sound beams allow to infer the vector components of the wind. A TSI is used to identify cloud types and cloud coverage. A USA measures the speed of sound at a temporal resolution of 10 Hz. 3 ultrasonic transmitter/receiver pairs are arranged in an angle of 120deg to each other, enabling the direct measurement of the 3-dimensonal wind vector and acoustic temperature. This allows the calcultaion of turbulence measures such as turbulent kinetic energy (TKE).